Previous studies reported that vitamin K, lutein, folic acid and beta-carotene are nutrients that can slow cognitive decline characteristic of aging. Martha Clare Morris, dellaa Rush University Medical Center (Illinois, USA), and colleagues studied 954 participants in the Memory and Aging Project, average age 81 years, recording their daily food and beverage intake based on a standard questionnaire. The researchers calculated the total daily nutrients combining nutrient content for each food consumed by the number of servings you eat every day. The subjects were followed for up to 10 years, during which they were evaluated for changes in cognitive abilities. 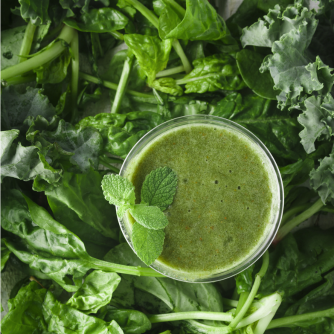 After adjustment for confounding factors, the team found that subjects who consumed higher amounts of leafy greens have experienced a decrease reduced the rate of cognitive decline compared to those who consumed little or no green veggies. People who ate 1-2 servings per day had the cognitive ability of a person 11 years younger than those who have not consumed any. The team then found that green leafy vegetables are abundant in vitamin K, lutein, folic acid and beta-carotene.